In 1980 I decided to do something that was very unusual for me at the timeâ€¦.read a book! The book I chose to read was â€œCosmosâ€ by Carl Sagan. I know most of you reading this now have read Cosmos at some point in your life and therefor understand the impact it could have on a young man interested in science. Well, It had a profound impact on me! From that moment on I became an avid reader of anything scientific especially astronomy. Over the years my interest oscillated and I always had the dream but not the means of owning a quality telescope. Skip forward to the 21st centuryâ€¦.. My daughter is off to college and I am somehow teaching Astronomy part time at Battles Elementary School in Santa Maria without having graduated from college. I decide that it is time to take the plunge. Like all of you I research the internet until I canâ€™t see the PC screen in focus and I come to the conclusion that the best option for me is the Meade 10â€ Starfinder Equatorial. After several nights of viewing and seeing other scopes owned by my new friends at the CCAS, I soon realized what I have always known about myself, that I have a very short attention span and would soon become bored of trying to locate objects on my own and view them visually. 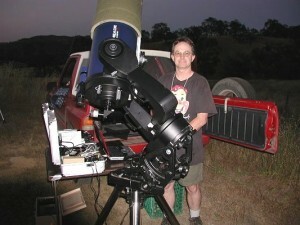 So off I go to exchange my scope for the instrument I really new I wanted from the get goâ€¦.the Meade LX200 10â€. Ok, now were talking. The only thing missing now is astrophotography. My first attempt is with a Sbig STV all in one monochrome CCD system. After 2.5 years now of CCD experience I canâ€™t think of a better system to start with. I soon came to realize what was missing was higher resolution and COLOR. So now I have graduated to a Starlight Express MX7c all in one color system with self-guiding options. Wow, I am doing now what 7 years ago could only be done in a major observatory. This system also allows me to venture into the world of film astrophotography which I am tinkering with now. Thanks to Carl Sagan, the Internet and the wonderful friends I have made through the CCAS I am fulfilling a lifelong dream. Thatâ€™s my story in a nutshell. CCD stands for Charged Coupling Device. It is basically a Digital camera on steroids. A computer chip in a shell that allows itself to be bombarded with electrons. Usually requires a PC with appropriate software to control the camera and display imaging results. Used primarily for Astrophotography! The camera is mounted to the telescope in place of an eyepiece. What is the minimum equipment I need to do astrophotography? A film camera that allows open shutter settings and a mount that will track.